PB-10N Hydraulic Pipe Benders: Izumi Products. The PB-10N was designed to bend various sizes and thicknesses of steel pipes without wrinkles. 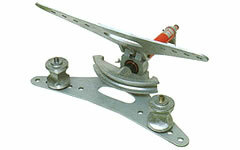 An aluminium alloy frame makes this bender lighter so that it can easily be carried to the job site. 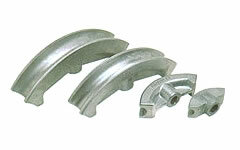 Bending shoes are designed to bend JIS standardised conduit pipe and gas pipe listed. If the pipe outer diameter being bent is equivalent to the one from the list, the shoe can be used for the application.